The Beta release of Flutter from Google has caught the attention of several developers and that includes me. I am always interested in trying out developer tools and understanding how companies are pushing the envelope in terms of productivity. This blog post is by no means a detailed tutorial on Flutter and for that matter Google Cloud Functions, but aims to demonstrate how straightforward it was for me to put together the two. What we shall build? A Famous Quotes Application. We all love inspirational quotes .. don’t we? This is a simple “Famous Quotes” app that has just single screen and shows a random famous quote. We shall use Flutter to create our mobile application and we will deliver a random quote to the Flutter mobile application via Google Cloud Functions, which is the Serverless FaaS (Functions as a Service) available on GCP (Google Cloud Platform). The Quotes are completely managed by a Google Cloud Function that we shall deploy. For the sake of keeping things simple, we will simply have about 3–4 quotes available as sample data in the function itself and it will return us a random quote. So, when we click the Get a Random Quote button that you see in the screen, it will directly invoke the Google Cloud Function that we have deployed and then render the data. Sounds good? Let’s get going. You should have a Google Cloud Platform account with billing enabled. Google Cloud Platform comes with a generous Always Free tier, which you can use for this tutorial. Create a new Project via the Google Cloud Platform console. Click on that and then Enable the API. Setup Flutter Development Environment on your machine. The Flutter Documentation is one of the best that I have seen and the Getting Started section is comprehensive in getting your environment setup on a platform of your choice. I am using a Mac and Android Studio. Please be patient while setting up the environment, especially if you do not have Android Studio installed on your machine. I used an Android Virtual Device (AVD) to test out the application and you could use that or probably an actual device. I leave that to you. I am going to demonstrate developing our function completely in the cloud via the Google Cloud console. The only reason I am doing this is to keep things simple and our function is very compact and there is nothing much to it. In a real world scenario, I expect that you do your development locally and either deploy it from a repository or from your local machine via the gCloud SDK. Assuming that you are logged into to Google Cloud Console and selected your specific Google Cloud Platform project, navigate to Cloud Functions. Memory Allocated : We can go with the least amount of memory since our function is not doing too much. Go with 128 MB. 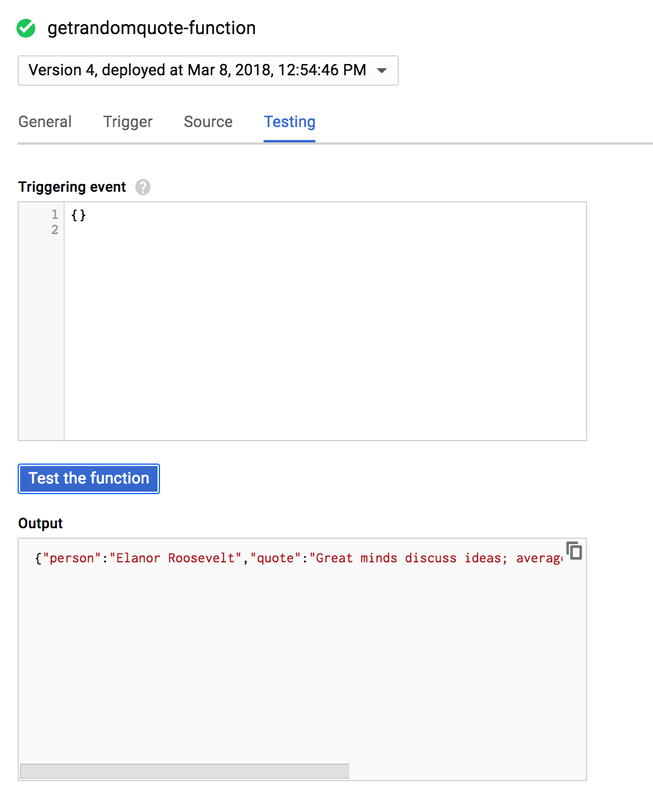 Trigger: Cloud Functions are executed in response to a trigger. GCF supports multiple triggers like HTTP Trigger (direct invocation), subscribing to a Pub/Sub message, Google Cloud Storage (GCS) events, etc. For our scenario, we will have the Flutter App directly making a HTTP call to our function, so we will go with HTTP Trigger in this case. Notice that it creates a unique URL for your function. Please note this down. We will refer to this URL as FUNCTION_URL for the rest of this article. Source Code : We will provide the source code in the inline editor itself. So go with Inline Editor. 7. Function to execute : In this field, the value will be getRandomQuote as you can see from the exports field in the above code. Simply click on the Test the function button and you should get the output. Please make a note of the FUNCTION_URL as mentioned earlier. You will need this in your Flutter App. You can also test out the FUNCTION_URLdirectly in your browser and you should get a similar JSON output for a particular quote. Great! Now that we are done with developing our GCF, it is time to take a look at the Flutter App. Since I have just started with Flutter, I heavily relied on the documentation to help me get started. Here are a couple of specific links that helped me understand the basics of a simple Flutter App. I strongly recommend that you go through the above documentation links. They are worth your time to understand what is going on. The source code is pretty standard for building out a single screen app in Flutter. We begin with MyApp but notice that our home attribute is a Stateful Widget RandomQuotes. We are maintaining a variable named _randomQuote in our state. Initially it is set to “-”. Our scaffolding for the widget includes a Text field that will contain the value of the random quote and a button, which will invoke the _getRandomQuote() function on clicking it. The _getRandomQuote() function makes a call to the FUNCTION_URL (be sure to replace it with your function url), parses out the JSON and then sets the value in the _randomQuote variable. If you have followed the previous 2 links that I provided to the documentation, this code is heavily borrowed from there, so I suggest that you study that. You could run the application directly from Android Studio or from the Terminal, go to the root folder of the application and give flutter run command. If all goes well, you will see the Famous Quotes App working for you, all powered by Flutter and Google Cloud Functions.